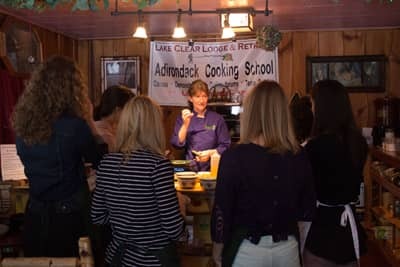 From 30 minute cooking demonstrations before you enjoy our Great Camp Dining experience to weekend long culinary immersions in Traditional Food preparations to "Nutritional Energetics for a new age". .... Join Cathy inside her unique programs. Welcome to "Nourishing Your Multidimensional Body"
From the "10 Essentials of your Nourished Pantry" and her "Sourdough Challenge" to "Cooking with Essential Oils" and the "Multi-dimensional world of Nutritional Energetics," there is something for everyone who wants to up the vibe of what you eat. The focus is on fun, interactive programs. Thirty minute cooking demos, culinary and nature weekends, and intensive Nutritional Energetics Institutes are experiences you can do while simply coming to our Adirondack Alps Restaurant, while on vacation, or even online! Every evening the restaurant is open, Chef Cathy offers a 30 minute cooking demonstration by prior sign up. For 30 minutes, she will share one of the secrets of her Old World, Nutritional Energetics philosophy and open the door to her many wellness cooking techniques. While the topic of the demo changes nightly, you can always expect an experience that is informative and fun! Eating Local and with the Seasons is important for many reasons : but one you may not know is that local foods resonate with your body. They have the ability to offer more bioavailability of their nutrients. Chef Cathy can guide you through the seasonal changes for both foods and energetics and bring back more vitality to your kitchen and to your life. Come on in to an online class and chat, or visit us at our home for a getaway. Do you have a group you would like to create a class for? Chef Cathy can offer her space or come to yours, either onsite or by Zoom platform virtually - have a cooking party and "bring Chef Cathy into" the party! Chef Cathy can guide you through a fun "Make your own Rosti" or have a "Girls Night Out" and hey guys - impress a friend by cooking dinner at your house! Chef Cathy can guide you through the easy steps to create a great meal for your occasion. Chef Cathy has been interested in nutrition and was cooking for her family as long as she can remember. Her lifelong pursuit has led her to study many diets and a lot of nutritional information leading to studying the human energetic "blueprint." She has been cooking professionally for her restaurant for over 30 years and has served over 300,000 bowls of bone-broth soup. With this information she has developed a program called Nutritional Energetics - nourishing all nine levels of mind, body, and soul through foods and energetics. Come explore this unique program! Cook a bit, learn a lot and stay nourished. Ask a question thru The Lodge contact form HERE and sign up for our Lodge newsletter.